Introducing the completely redesigned RibCor 70K skate. It was time for a change and it culminated in a fully revamped skate built from leading biomechanics research and feedback from the NHL’s top players who choose to wear this skate. RibCor 70K features the innovative FlexFrame Technology which offers excellent forward flexion and the best lateral stability to provide players like Crosby, Duchene, Forsberg and Tatar with the most optimized skating stride in hockey. LIGHTWEIGHT SKATE CONSTRUCTION Premium composite materials help reduce the weight for the skate by over 70 grams versus the previous generation. CONTOURED HEEL LOCK DESIGN A new high definition heel lock and ankle lock boot shape replaces the need for the Pump from the previous generation while offering a flexible fit for all players. FLEXFRAME TECHNOLOGY Based on industry leading biomechanics research conducted with top NHL players, the FlexFrame Technology provides excellent forward flexion to help players generate power and lateral stability which helps to maximize energy transfer with every stride. QUARTER PACKAGE - COMPOSITE QUARTER 3D-lasted quarter with ultimate forward flexion and lateral stabilitydesign, maximizing the skater’s stride. FIT - FLEXIBLE FIT Provides a contoured and snug fit for all players. CORE - FLEXFRAME TECHNOLOGY Flexion zones in the eyelet area, combined with strategic reinforcements in the rest of the core offers a bio-mechanically correct stride. LINER - TOTALDRI LINER WITH DURAZONE ABRASION PROTECTION High performance moisture-wicking material keeps feet dry and skates light. COMFORT PAD - SMOOTH CONTOUR PRO Soft pad around collar of the boot for superior foot and ankle comfort. ANKLE PADDING - MULTI-DENSITY MEMORY FOAM Symmetrical foam comfort pads wrap anatomically around player’s foot for customized fit and comfort. TONGUE - TRITECH PRO TONGUE WITH MOLDED LACE-BITE PROTECTION Three-layered, 7mm felt with HDPE foam and injected lace-bite prevention zone for increased comfort and protection. 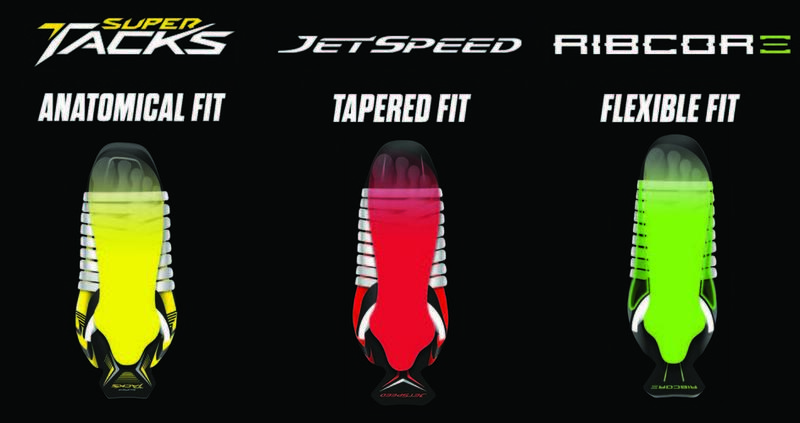 MOISTURE - LIGHTWEIGHT COMPOSITE MIDSOLE Enhanced energy transfer platform for blade to boot interface. OUTSOLE - EXTRA STIFF CARBON COMPOSITE WITH EXHAUST SYSTEM Offers torsional rigidity to maximize energy transfer. FOOTBED - GRIPTONITE Locks a players foot in the skate while providing excellent support and comfort. 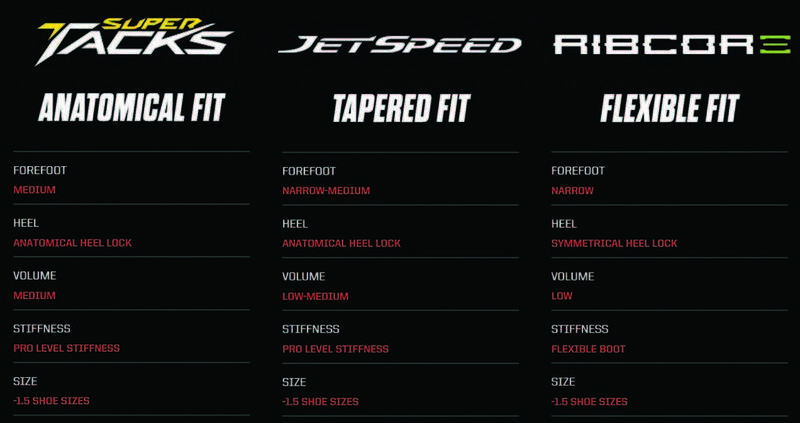 HOLDER - SPEEDBLADE 4.0 Proven durability with increased attack angle providing greater strides and cornering. RUNNER - SPEEDBLADE BLACK Premium blade with oxide treatment provides a harder runner with a longer edge life and excellent resistance to corrosion.